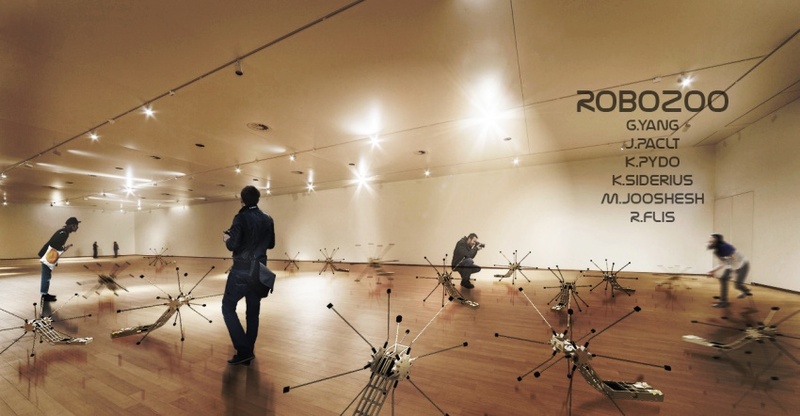 RoboZoo aims at establishing the artificial environment of the interactive swarm of robots. Synergetic integrity with such a substance is the subject of our interest. Investigation of models of behaviours plays a paramount role in the presented concept. The possibility of shaping the environment by artificial creatures bring about the potential for dynamic system and its adaptability to the outer and inner changes. Motion and visual expression of each independent robot evokes instantenous response in the environment. People perceiving remodelled swarm of artficial creatures are forced to reestablish themsleves in the space in real time. Borders are constituted mutually by robots and humans, as they are sending signals to respective sensors. Therefore they are both altering behaviours. Mutual communications between both people and robots actuate the ceasless spatial reconfiguration. Robotic sensors are detecting every change in the ecosystem and trigger a constant loop of unexpected transformations. The balance between autonomy and control induces people to discover each independent principle. These essences trigger effortless processes of comprehension and immediate interaction. This page was last modified on 23 March 2016, at 12:07.